"To The Memory Of ~ Our Unknown Dead ~ Asleep Unnamed And Unknown ~ Until Gods Angels On The ~ Whirlwind Rides ~ To Claim His Own". "To The Memory Of ~ Our Soldiers Who ~ Starved In Southern ~ Prisons". "To Our Heroes Of ~ 1861-1865 ~ Dedicated ~ May 30, 1895". "Erected By ~ John Anderson ~ Womans Relief Corps ~ No 194 Wilder Kan". 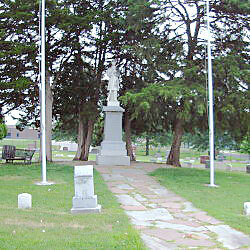 The base of the monument has the marking: "H.E.Barker ~ Kansas City." The step in front of the marker reads "In Memoriam". 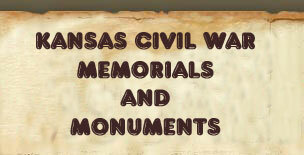 Description: Soldier monument costing $1000, raised by Franklin post No, 68. The base and body of the monument is of granite, surmounted by a life-size figure of a soldier standing at rest, executed in white marble. 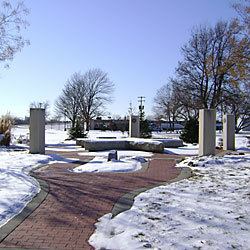 In a circle at its base are buried thirty-seven soldiers. The inscription reads: "Erected By ~ Franklin Post ~ No. 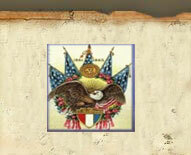 68 G. A. R. ~ In Memory Of ~ Our Dead Comrades." 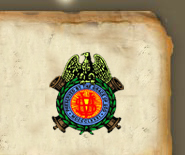 On the north side is a representation of a G. A. R. badge and the date 1893. It was erected in 1893. Dedicated Memorial Day 1897, by John Smith Post, Department of Kansas, Grand Army of the Republic. Description: The central feature of this park is a large granite star surrounded by vertical columns portraying the seals of the branches of the modern US Military. 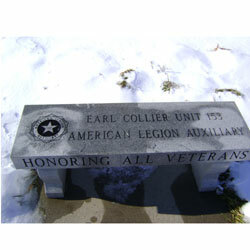 Also included are benches, inscribed with "American Legion seal ~ Earl Collier Post 153 ~ The American Legion ~ For God and Country" and "American Legion Auxiliary seal ~ Earl Collier Unit 153 ~ American Legion Auxiliary ~ Honoring All Veterans". 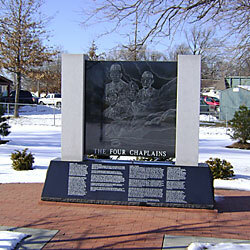 Secondary features include a large granite memorial with a central polished black granite slab reading: "The Four Chaplains ~ To all Chaplains who ministered to those men and women who stood in harms way as sentinels of our freedom ~ George L. Fox ~ Alexander Goode, Clark V. Poling ~ Johnny P. Washington ~ additional information on each person". 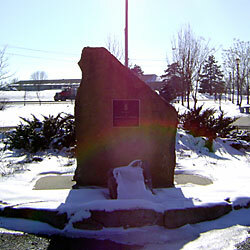 A Memorial to Stanley Adams,. Medal of Honor Recipient - Korea" and a POW marker are also present. Description: This marble marker is engraved with an American Legion shield and "Dedicated to those ~ who have served ~ to safeguard Justice, ~ Freedom, and Democracy" and "Peter Smith Post 327 ~ Shawnee, Kansas". 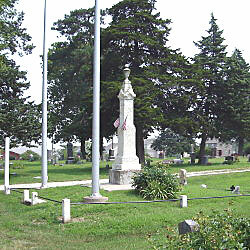 A flagpole is mounted near the marker. 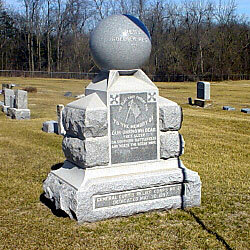 Description: Granite monument with large polished granite orb on top. The orb is inscribed: "Rest ~ Soldier Rest". The front of the monument is inscribed: "The Flag They Fought For ~ (engraving of US Flag) ~ To The Memory Of ~ Our Unknown Dead ~ They Sleep ~ On Southern Battlefields ~ And 'Neath The Ocean Waves ~ General Curtis Relief Corp No 28 ~ Dedicated May 30, 1897". 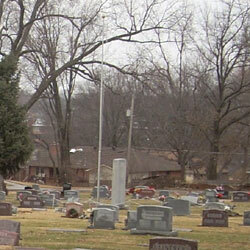 The back of the Monument is inscribed: " To The Memory Of ~ Those Soldiers Who Fell ~ During the War Of ~ 1861 to 1865". 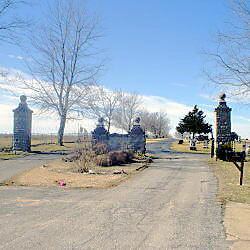 Description: The Cemetery is entered through two columns separated by one-way single lane roadways with a central brick and stone monument in the center. The center panel of the monument is inscribed: "Springhill Cemetery ~ In Honor Of ~ The Veterans Of The Civil War ~ 1861-1865, The Spanish American ~ War 1890, Our Country's Defend- - ers In The World War 1917-1918 ~ And The Loyal Women Of ~ Springhill And Community ~ Sponsored By W.R.C. No 28 A.D. 1923". On the back side of the panel is mounted a small brass plaque reading: "In Memory Of The ~ Meyer-Dunn Family".